Approx. 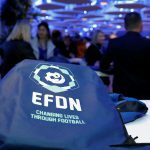 150 delegates from all over Europe met in Ghent for the 11th EFDN Conference “CSR in Football” on the 13th and 14th November. The conference started with an opening speeches from Ivan De Witte, the chairman of hosting club KAA Gent and Ton Strooband, Chair of EFDN. 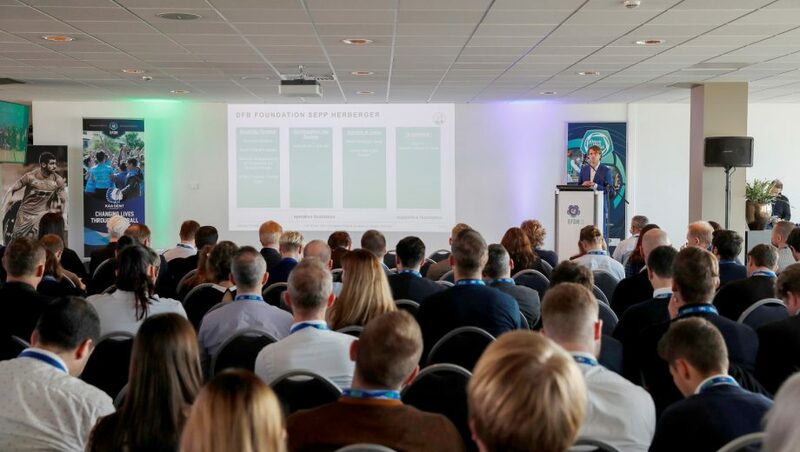 Mr De Witte highlighted that the strong connection between the club, its Community Foundation and the city of Gent with the communities in Gent is the biggest achievement of the clubs in the last years. Ton Strooband, Chair of the EFDN board, welcomed all the delegates and highlighted the positive aspects of “togetherness”. 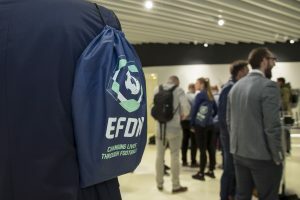 The first day of the EFDN conference continued with networking roundtables that were used by the delegates from clubs, Leagues, FAs and other stakeholders in European football to get to know each other. Peter Klomp from the UEFA presented the development and impact of the #EqualGame campaign and emphasised that good story-telling and a localised approach can lead to a high visibility. Afterwards, Nico Kemp of the DFB foundation Sepp Herberger presented their disability football programmes. “Integrate the disabled people in the development and implementation of your disability programmes”, is one of the success factors for disability football projects said Mr. Kempf. Representatives of Feyenoord Rotterdam, Legia Warsaw, Shakhtar Donetsk and Aston Villa presented their programmes in the first break out sessions. Maarten van Holstein presented the Fancoach programme of Feyenoord Rotterdam. He explained how trust, talks and an “alternative route” can prevent violence and stadium bans of supporters. Karolina Kalinowska (Legia Warsaw) and Yuri Sviridov (Shakhtar Donetsk) spoke about the development of new programmes and partnerships as well as challenges in the social and community work. In the first presentation in the afternoon, Yolanda Antin presented the new strategy of the Barça Foundation by using impressive video material. Community. Hart underlined that the quality and the satisfaction of the 100 staff members is one of the important factors for a positive development and explained the potential and risks of an opportunity driven approach. Michael Viggars represented the European Healthy Stadia Network. He spoke about the ongoing and upcoming projects of the NGO dedicated to helping national governing bodies of sport, league operators, clubs and their foundations to develop their stadia as health-promoting environments. 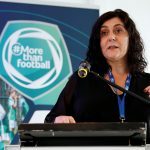 Elena Montoro Garcia from LaLiga focused on the LaLiga Genuine project, a social responsibility and integration initiative, that has led to a league composed of teams of people with intellectual disabilities. Mrs Montoro Garcia also provided an overview of other LaLiga Foundation activities that make an impact on Spanish society on a daily basis. The first day was concluded with a panel discussion with former professional football players Erlend Hanstveit, Pat Nevin and Tony Higgins and the presentation of the 4th EFDN Practitioner’s Guide about player involvement in CSR. The three former players shared their experiences of player visits and highlighted the positive (mental health) effects on players and beneficiaries. Furthermore, Erlend Hanstveit provided the delegates with an insight into his research on Player Social Responsibility in Norwegian Football. Day 2 began with a presentation of the Brussels-based United Nations Regional Information Centre (UNRIC) about its work and the Sustainable Development Goals (SDGs). The aim of the presentation was to inform the delegates about possibilities for the implementation of the SDGs in their community work and future opportunities for collaboration. In the following networking roundtables, concrete ideas and suggestions for the strategy, activities and objectives of EFDN and future programmes were discussed and collected. For the third and last breakout sessions of the event, the delegates could choose between presentations of Olympique Lyonnais, the Belgium Pro League and Tim Breitbarth (CSR Communication in Europe). Maelle Trarieux presented the new CSR action plan from Olympique Lyonnais which includes collaborations with all the departments of the club, including professional male and female players, and the development of a global project that also stimulates business. Tim Breitbarth explained that no communication is also a form of communication and underlined the importance of carrying out a communication strategy that fits the audience and the own goals. The expert in CSR-communication provided the delegates not only with the results of his research but also shared tips that will be very helpful for the practitioners. The roundtables were followed by a presentation of the Charlton Athletic Community Trust. 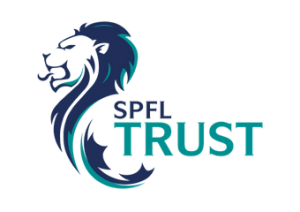 Chief Executive Jason Morgan presented the projects of the trust and results of the most recent Impact Report. In the afternoon the delegates had the chance to meet practitioners and programme participants from host KAA Gent Foundation at three different study visits. The conference participants visited a programme for homeless people, a local collaboration in youth football or the community building of KAA Gent. The 11th EFDN Conference ended with a Wrap-Up and some final remarks. The first feedback of participants has been very positive and we hope that the delegates took a lot of inspirational ideas, new contacts and concrete advises for the day-to-day activities of their institutions back home.